(ahrch) a structure of bowlike or curved outline. arch of aorta , aortic arch the curving portion between the ascending aorta and the descending aorta, giving rise to the brachiocephalic trunk, the left common carotid artery, and the left subclavian artery. Arch of aorta (arcus aortae). aortic arches paired vessels arching from the ventral to the dorsal aorta through the branchial arches of fishes and the pharyngeal arches of amniote embryos. 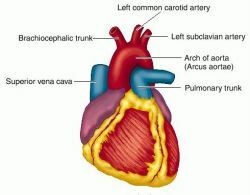 In mammalian development, arches 1 and 2 disappear; 3 joins the common to the internal carotid artery; 4 becomes the arch of the aorta and joins the aorta and subclavian artery; 5 disappears; 6 forms the pulmonary arteries and, until birth, the ductus arteriosus. 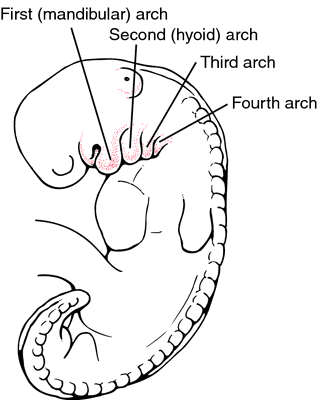 branchial arches paired arched columns that bear the gills in lower aquatic vertebrates and which, in embryos of higher vertebrates, become modified into structures of the head and neck. In human embryos, called pharyngeal a's. cervical aortic arch a rare anomaly in which the aortic arch has an unusually superior location. dental arch the curving structure formed by the teeth in their normal position; the inferior dental a. is formed by the mandibular teeth, the superior dental a. by the maxillary teeth. double aortic arch a congenital anomaly in which the aorta divides into two branches which embrace the trachea and esophagus and reunite to form the descending aorta. arches of foot the longitudinal and transverse arches of the foot. lingual arch a wire appliance that conforms to the lingual aspect of the dental arch, used to promote or prevent movement of the teeth in orthodontic work. 1. the first pharyngeal arch, from which are developed the bone of the lower jaw, malleus, and incus. 2. superior dental a., see dental a.
neural arch the primordium of the vertebral arch; one of the cartilaginous structures surrounding the embryonic spinal cord. open pubic arch a congenital anomaly in which the pubic arch is not fused, the bodies of the pubic bones being spread apart. oral arch one formed by the roof of the mouth from the teeth (or residual dental arch) on one side to those on the other. palatal arch the arch formed by the roof of the mouth from the teeth on one side of the maxilla to the teeth on the other or, if the teeth are missing, from the residual dental arch on one side to that on the other. palatoglossal arch the anterior of the two folds of mucous membrane on either side of the oropharynx, enclosing the palatoglossal muscle. palatopharyngeal arch the posterior of the two folds of mucous membrane on either side of the oropharynx, enclosing the palatopharyngeal muscle. palmar arches four arches in the palm: the deep palmar arterial a. formed by anastomosis of the terminal part of the radial artery with the deep branch of the ulnar, its accompanying deep palmar venous a., and the superficial palmar arterial a. formed by anastomosis of the terminal part of the ulnar artery with the superficial palmar branch of the radial and its accompanying superficial palmar venous a.
pharyngeal arches the branchial arches in the human embryo. plantar arch the arch in the foot formed by anastomosis of the lateral plantar artery with the deep plantar branch of the dorsal artery. pubic arch the arch formed by the conjoined rami of the ischial and pubic bones on two sides of the body. pulmonary arches the most caudal of the aortic arches, which become the pulmonary arteries. residual dental arch the curved contour of the ridge remaining after tooth removal. right aortic arch a congenital anomaly in which the aorta is displaced to the right and passes behind the esophagus, thus forming a vascular ring that may cause compression of the trachea and esophagus. supraorbital arch the curved margin of the frontal bone forming the upper boundary of the orbit. tarsal arches two arches of the median palpebral artery, one of which supplies the upper eyelid, the other the lower. vertebral arch the bony arch on the dorsal aspect of a vertebra, composed of the laminae and pedicles. Vertebral arch (arcus vertebrae). The vertebral arch consists anteriorly of a pair of pedicles and posteriorly of a pair of laminae. zygomatic arch one formed by processes of zygomatic and temporal bones. Anatomy An organ or structure having a curved or bowlike appearance, especially either of two arched sections of the bony structure of the foot. any anatomical structure that is curved or has a bowlike appearance. Also called arcus. n a structure with a curved outline, such as bone. n the composite structure of the dentition and alveolar ridge or the remains thereof after the loss of some or all of the natural teeth. n a dental arch containing natural teeth. n a labial arch wire adapted so that it lies gingival to the anterior tooth crowns; it has auxiliary springs extending downward in contact with the teeth to be moved. n the length of a dental arch, usually measured through the points of contact between adjoining teeth. n the space available for all teeth. n the difference between required and available arch length. n the sum of the mesiodistal widths of all teeth. n an arch that curves continuously from the molars on one side to the molars on the opposite side so that two such arches placed back to back describe an oval. n (glossopalatine arch), the pillars of the fauces; the two arches of mucous membrane enclosing the muscles at the sides of the passage from the oral cavity to the pharynx. n a dental arch from which one or more but not all teeth are missing. n an orthodontic appliance effective in maintaining space and preserving arch length when bilateral primary molars are prematurely lost. n an arch wire designed to fit the lingual sur-face of the teeth. It has two posts soldered on each end that fit snugly into the vertical tubes of the molar anchor bands. n an arch wire designed to fit the lingual surface of the teeth and soldered to the anchor bands. n a dental arch that converges from molars to central incisors to such an extent that lines passing through the central grooves of the molars and premolars intersect within 1 inch (2.5 cm) anterior to the central incisors. n an arch that has the same convergence as a tapering arch but to a lesser degree. The anterior teeth are somewhat square to abruptly rounded from canine tip to canine tip. The canines act as corners of the arch. n a dental arch in which there is little difference in diameter (width) between the first premolars and the last molars; the curve from canine to canine is abrupt, so a dental arch in the shape of a capital U is formed. n the width of a dental arch. The width, which varies in all diameters between the right and left opposites, is determined by direct measurement between the canines, between the first molars, and between the second premolars. These intercanine, interpremolar, and intermolar distances can be cited as arch width. n a wire applied to two or more teeth through fixed attachments to cause or guide orthodontic tooth movement. n a wire extending from the molar region of one side of an arch to the other. n a wire extending to only a few teeth, usually on one side or in the anterior segment.